The VirtuCrypt Intelligence Portal (VIP) Dashboard provides customers with control and visibility of their cloud from one convenient location. The VIP Dashboard is a powerful, secure, and intuitive web portal for reviewing all the information related to your VirtuCrypt environment. The VIP Dashboard can be customized to meet your organization’s unique needs. Its robust, modular interface, equips you to configure services, name and organize service groups, set up alerts, and add or remove client devices. Through the portal, system administrators can establish user permissions, control who has access to the cloud and the degree to which they can view or use the services. If you’re using a VirtuCrypt Elements service, the VIP Dashboard is the primary tool for setting up and maintaining your cloud service. Need to view certificate trees and sign certificate requests with the Object Signing Service? Or perhaps you’d like to assign keys to client devices for the Remote Key Management Service? Either way, the VIP Dashboard leverages everything necessary for your Hardened Enterprise Security Cloud environment. Virtually every aspect of your VirtuCrypt service package can be configured using the VIP Dashboard. On-the-fly customization capabilities mean that as your needs grow and change over time, the VIP Dashboard will adapt as well. Monitoring is made simple through the VIP Dashboard. Beyond viewing basic information such as performance statistics and the status of your services, the VIP Dashboard enables your VirtuCrypt infrastructure to be monitored for vital system parameters and activities. Customers can use the VIP Dashboard to set up alerts through a variety of methods, notifying system administrators if specified conditions are met. 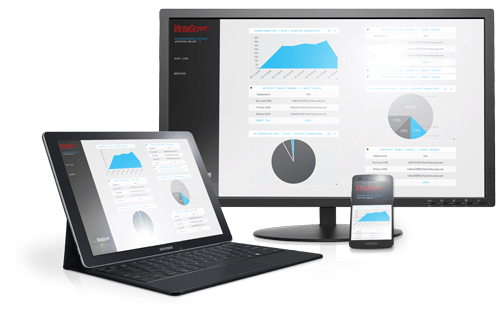 Users with audit permissions can view and export audit logs that contain reports on device usage, monitoring statistics, and activity, such as when users have logged in and out of the system. The VIP Dashboard’s powerful logging engine produces reports conveniently structured for both internal reviews and external compliance audits. Customers can request support through multiple avenues, including the VIP Dashboard, which allows you to submit support requests through an online form at your convenience. The portal also displays the status of current submitted VIP helpdesk requests, updating in real-time to track the request’s progress. The VIP Dashboard also serves as a resource library for all the documentation available for service use and setup. From user guides to frequently asked questions to API references, the VIP Dashboard gets the information you need whenever you need it. Billing information for your VirtuCrypt Services can be found on the VIP Dashboard. Current and past payment invoices can be viewed and exported directly from the portal, allowing your business to access its payment status at any time. This area of the portal also allows VirtuCrypt Elements users to request additional Elements service packages. The VIP Dashboard interface offers constantly-evolving, detailed documentation on common procedures, from adding key groups to presiding over user permissions. For common algorithms and cryptographic concepts, a detailed in-portal glossary provides additional guidance. This aspect of the dashboard ensures your organization’s training is simplified and that immediate direction is available. The VirtuCrypt Intelligence Dashboard (VIP) can be whitelabeled and branded according to your preferences. Whether creating brand affinity using your corporate logo and colors on the dashboard itself or using our web API for integrating services directly into your existing applications, the VIP Dashboard's whitelabeling capabilities give you the ability to deliver a seamless solution to your customers.